Well, if there was one word I could use to describe this evening's refight of Camden it'd be 'quick'. That said, it was actually a very fast moving and tense game. Not a walkover for the British by any means but a hard won victory, thanks to some extreme dice throwing! Rob played the British while John took the two Maryland Continental brigades and I had the Militia. 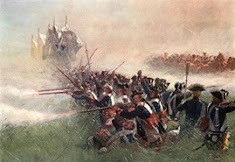 The battle kicked off with the British right advancing quickly to within 12" of the Virginia militia on the Rebel left. 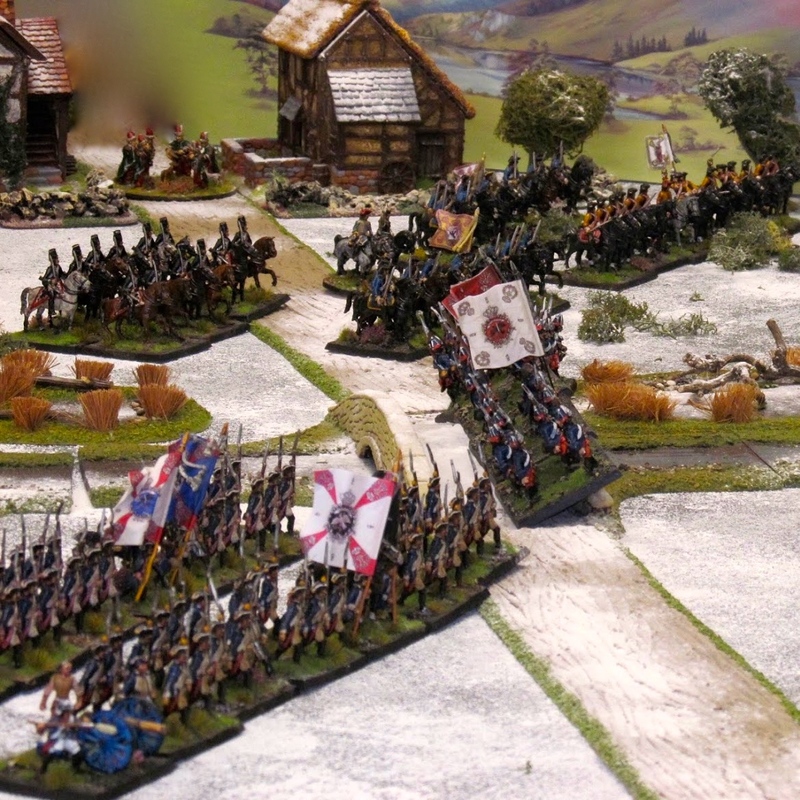 However, on their left, the Loyalist brigade under Lord Rawdon failed their command role and stood still. The NC Volunteers on the extreme British left actually withdrew a move (why Rob?). The reserve infantry under Tarleton also stayed put although the British Legion cavalry did advance. In the exchange of fire the Rebels took some heavy losses and two wavering regiments failed their break test and routed, leaving a couple of large holes in the line. The Rebel first move saw the militia on the left advance to within short range of the Light infantry battalion and the 23rd Foot. (It seemed like a good idea at the time). 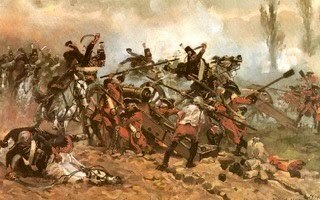 Both British units became disordered and this was the furthest the British regular brigade would get until the very close of the battle as they were held up, disordered and ocassionally shaken by some very good shooting and some unfortunate saving rolls. Meanwhile the Continentals under John had moved forward, partly to save the militia in the cnetre from taking a pounding (they were also wavering and would have to take a break test after taking 1 casualty), and the Virginia State Horse tried to plug the gap in the line left by a routing militia unit. This move was just in time as the Rob sent the British Legion into the gap, the Virigia Horse countercharged and by some miricle actually won the melee and sent the Legion packing! I even managed to get Armand's Legion cavalry to move, and they slipped past the extreme right of the British line in an attempt to cause some mischief in the rear. Of course, with a command value of 6 and being wavering and unreliable to boot that just wasn't going to happen! The game continued for another couple of moves, with the British left advancing at last against the Marylanders, while the reserve under Tarleton finally got moving and the two small'ish battalions of the 71st foot move close in to the Rebel centre. Both took heavy casualties and became disordered, and I think the one in the centre did become shaken after taking close range fire from the front and being enfiladed on the left flank. I can't really remember as at this point my militia units were taking losses and having to take break tests, which they survived - for a liilte while. The battle came to an end when the British Legion infantry charged the (shaken) Delaware battalion and routed them in the melee. Both supporting Continental units also failed their break test. At the same time I failed to save my militia and two more units ran away. This mean that the centre and right of the Rebel line was now in full withdrawal, leaving the remnants of the Virginia militia and a small Continental brigade to try and hold the line. 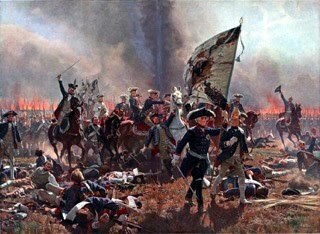 This they clearly would never be able to do so a little over an hour and a half after battle commenced the Rebels conceded defeat. 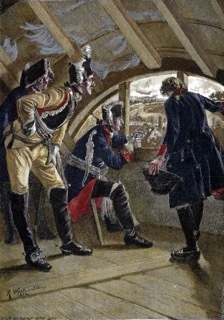 The British had won, but it was much closer than the final outcome might suggest. The regulars on the British right became bogged down and it was all Rob could do to keep them in the fight as they spent much of the game in a state of disorder due to some lucky throws from yours truly! On the British left, the Loyalists did well to overcome the Continental brigade, and when that happended it was all over! The general concensus was that the game was enjoyable, tense and that the rules yet again worked quite well. 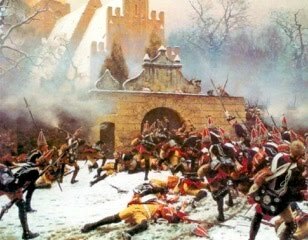 What did work was the classification of the really bad militia who proved quite capable of blunting the British advance as long as they didn't get shot at. They did get shot at of course, with predictable results. Likewise, the three rebular British battalions took quite a hammering but managed to remain intact (albeit immobile after turn 1) throughout the whole game. Very nice photos and game report.